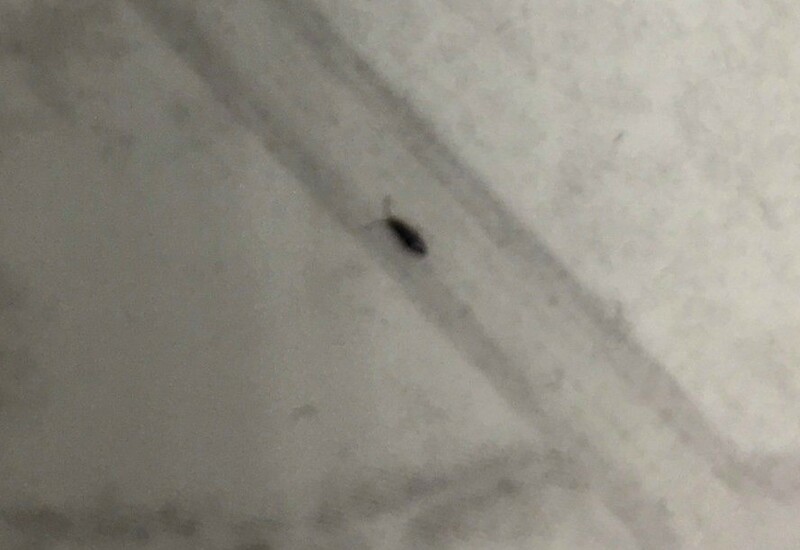 I've found these little black bugs in my bathroom the past 2-3 summers. I've noticed a few in my bedroom lately too; the bathroom is connected to bedroom. I have no idea what they are, but they bother me so much! They are super tiny, black bugs. They don't fly or bite that I've noticed. We have someone professionally spray our house in the fall and spring, I have sprayed in the bathroom and bedroom with good bug killing stuff, but yet cannot get rid of them. Please help! Put the bugs in a sealed plastic bag. Don't crush the bugs. Take it to a place that sells pesticides and and they can help you. There are so many different bugs this could be but it appears to like warm weather and maybe water/dampness. I believe you should call the exterminator that is doing the spraying and ask them about the bug problem you are having. Most likely they can tell you what it is and maybe they can be sure to add it to your name and be sure to spray or look for this bug when they return. Since it is only happening in the summer it must be the heat that is drawing them out. If your exterminator does not help you then I would suggest you call your county extension office and ask them as they are usually very familiar with bugs in general. Here is a link to help you find your local office. Normally the company you use to professional spray your home can identify this bug. It would seem that others around you should have the same issue. Catch one of the bugs and put it in a glass jar or plastic bag. Then, visit the company that sprays your home. Explain your problem to them and I am sure they know how to help you. I have the same bugs in my bathroom and recently found one I my room. I showed the people that spray my house and they dont know what they are. Hopefully after the internal spray they will go away. Did you even find out what they area? I discovered this same bug in our bathroom climbing the wall. Our bug guy is coming Monday to spray. Anyone find out what these are? I have identical bugs at the base of a shower where water was pooling under a bath mat and mold had begun to grow. I collected specimens and took them to the local IL county extension where I was informed they are Springtails. Not dangerous and do not cause damage to wood, but are attracted to moisture and mold. I was directed to thoroughly dry the area as much as possible for several days to include towel drying sinks and shower if I had to keep using them. which states spraying is pointless and that once you see them, they are probably massed somewhere outside or in the walls. Ugh.